Need to know about Lean Six Sigma, fast? Perhaps you’re at lunch with clients or in the midst of a boardroom discussion on Business Improvement, and the topic has turned to Lean Six Sigma. Well, you can relax because you’ve found the perfect blog for beginners. 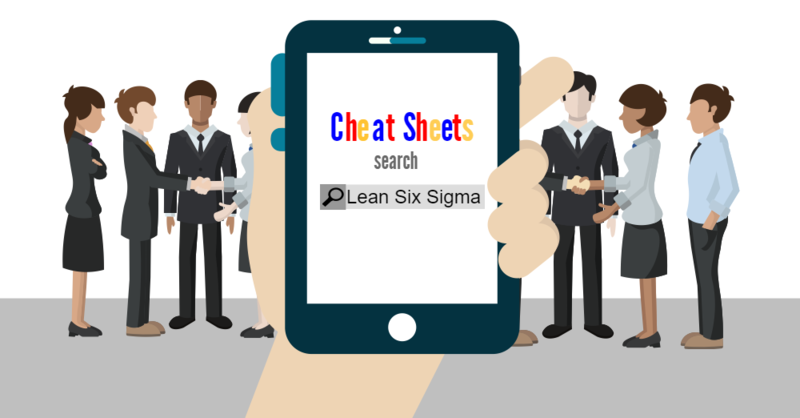 This Lean Six Sigma for dummies cheat sheet will provide you with enough information to get you through your current conversation without giving away that less than hour ago you assumed Lean Six Sigma was a diet drink. The approach is a combination of two Business Improvement methods, Lean and Six Sigma. To oversimplify it somewhat, Lean cuts the fat from the process, reducing areas of ‘Waste’ to increase efficiency; while Six Sigma standardises processes so that all outputs are continuously produced to the highest quality, every time. As both are data driven, share similar tools, techniques, and are ultimately customer focused, they form one super solution. Lean Six Sigma is a structured approach to both eliminate problems for good, and continuously improve processes by putting the customer first. By following its DMAIC structure and using the special set of tools, companies can find and extract the problem, ripping it out by the roots to ensure it never returns again. Why choose Lean Six Sigma? Although a structured approach originally used in the manufacturing industry, Lean Six Sigma is adaptable to all companies, regardless of industry or location. 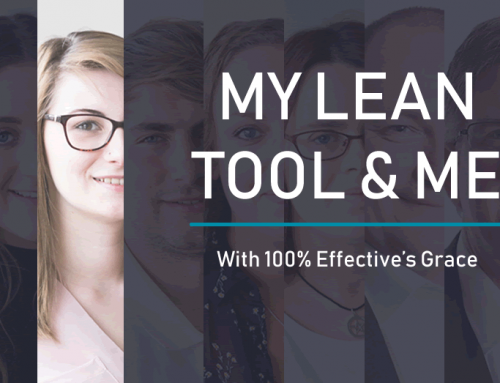 It is a cultural change with a structure as a guiding road to find and eliminate the root cause of a problem, and tools that are a pick ‘n’ mix of the sweetest solutions to suit your company. Lean Six Sigma not only solves problems so you get the most our of your processes, it will also help you get the most out of your people! The approach unites companies by promoting open communication and encourages all employees to continuously generate ideas for improvement. In short, successful implementation of Lean Six Sigma is proven to reduces costs, grow profits, and increase both employee and customer satisfaction. 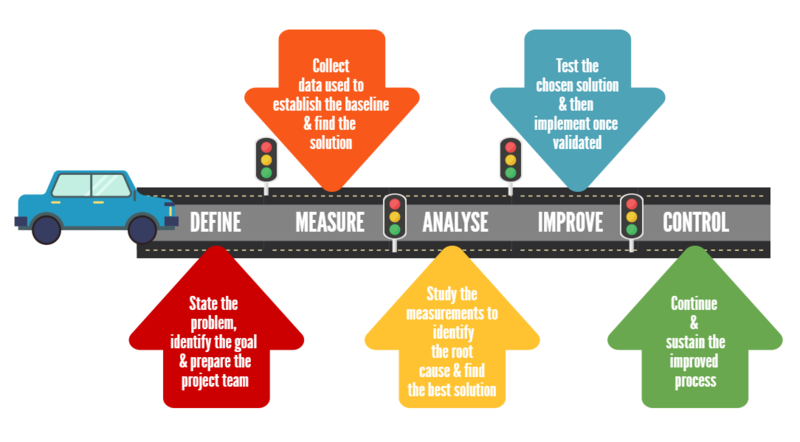 The DMAIC structure is a series of five phases that guide you to find and eliminate problems from your process, and put in place procedures to ensure they don’t return. These phases are: Define, Measure, Analyse, Improve, and control. They are each are made up of individual steps, all of which have their own tools and techniques. As you begin to hear the words ‘Green Belt’ and ‘Master Black Belt’, you could be forgiven for thinking that the conversation has now moved on to martial arts. However, there’s no need to frantically Google search a cheat sheet on martial arts, as these coloured belts are actually the titles given to Lean Six Sigma trained individuals. 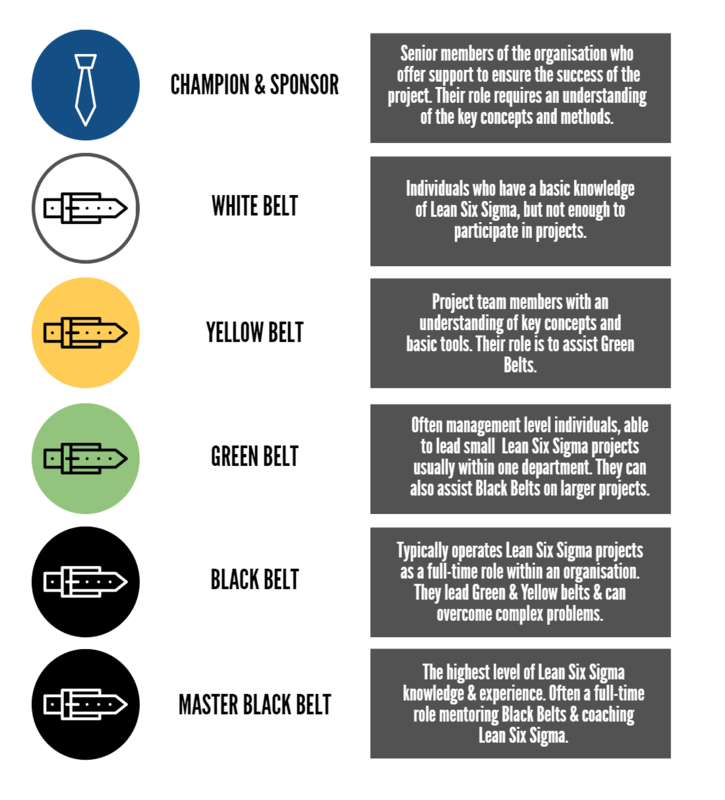 Similar to the belts in martial arts, the colours and titles symbolise an individual’s level of Lean Six Sigma knowledge and experience, while also defining their roles within projects. This cheat sheet should help you survive any brief Lean Six Sigma discussion, but if it has also sparked an interest in Lean Six Sigma, why stop here? Click on the button below to begin our FREE online Lean Six Sigma course and carry on your journey with the brilliant Business Improvement method. 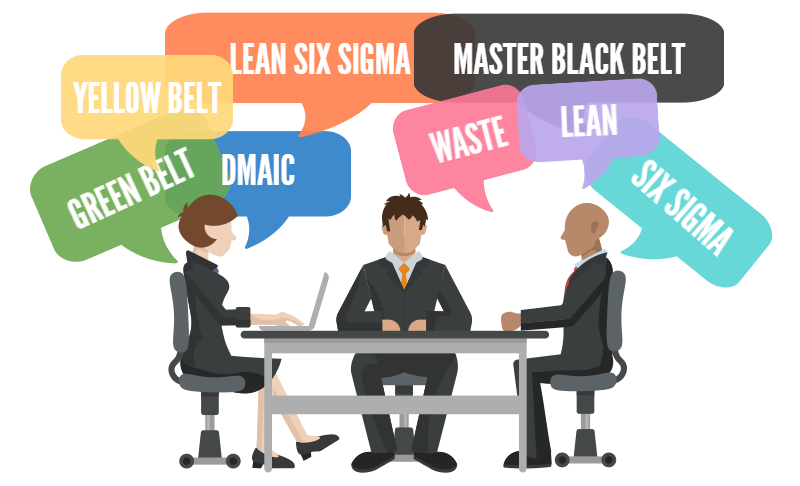 As the saying goes: “The master in anything was once a beginner”, so this Lean Six Sigma for dummies article may just be the start of your transformation from beginner to Black Belt.